28 cu. 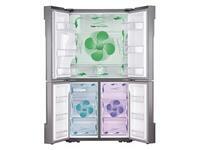 ft. large capacity 4-Door Flex™ refrigerator has enough room to fit up to 28 bags of groceries*. Innovative food showcase design that gives easy access to on-the-go items such as drinks and condiments. 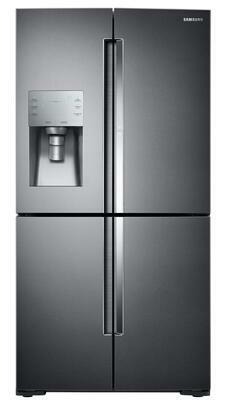 Stainless steel paneling locks in cold and seals in freshness. 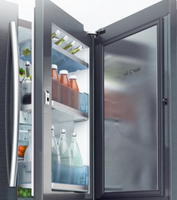 The Samsung Ice and Water dispenser provides a uniquely-tall opening so pitchers and tall decorative glasses can be filled quickly and easily. 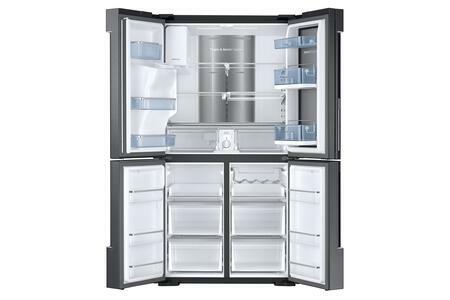 The external ice and water dispenser also serves as a filter, ensuring that plenty of filtered water, crushed ice and cubed ice is always on hand. 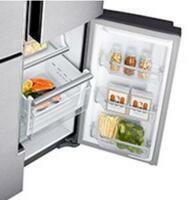 Innovates the way you store food. It gives you easy reach of key items that are most often used, all visible in one glance. 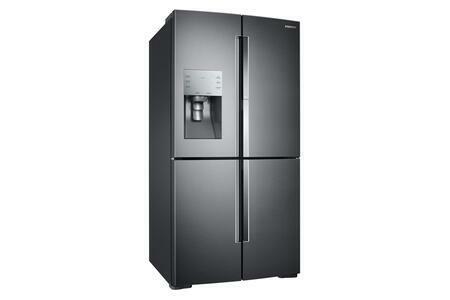 Depth with Door at 90 Degrees: 47.625"
This refrigerator looks really great. The door in door feature which I use all day long. Easy to open to get milk, juice and bottle water without opening the whole door. there are plenty of shelves in both cooler and freezer. I have set the bottom right side as freezer at this moment and I will try the Flex Temp feature as soon as my party at my house. It came in as the date it was promised with phone call the day before and about 30 minutes before. It worked great for me. The delivery men brought in the frig all the way to my kitchen and put it in place. Great service. Pros: Door in door and Flex Zone feature. Cons: Ice maker is kind of slow to produce and dispense. The delivery personnel were very courteous and performed as advertised. 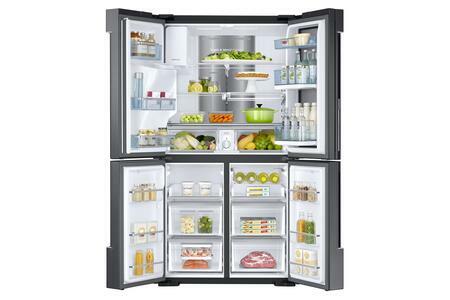 It`s a great refrigerator, but a little too expensive for the average american. 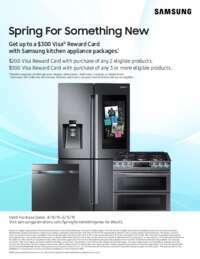 Love the product and service received from Appliance Connection"
This is the third time I have ordered from this company. Service has been great and the products have been the cheapest I could find anywhere all three times. Highly recommend doing your business here. 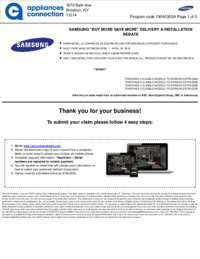 Very easy to do business with and great communication. 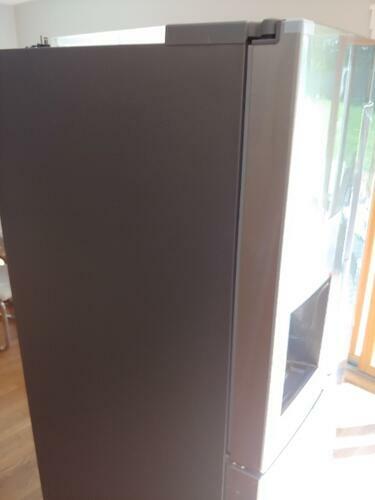 Went from a side-by-side to this beautiful French door refrigerator. 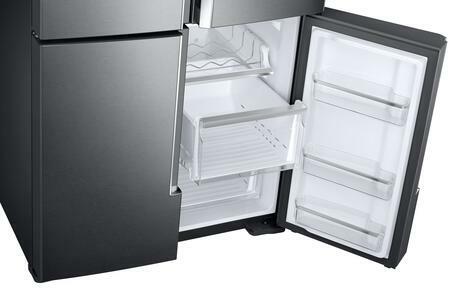 So much more room in both the refrigerator and the freezer. The drawers in the freezer are a great size and hold so much - but it is still easy to find everything. For me, I fell in love with the `handles` or lack thereof - think it adds an `elegant` touch. 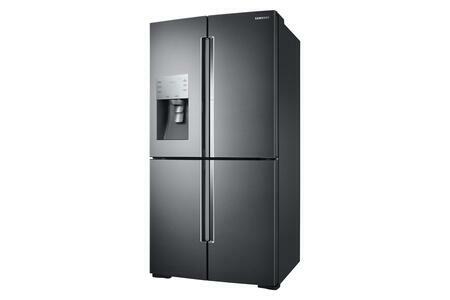 Finally, love the black stainless steel and will be changing all of my appliances over to it. Pros: So roomy and it really is a quality product - nothing cheap or flimsy! Cons: Had it for almost a year and have absolutely no complaints! Cons: Not easy to store bottle or gallon jar without losing a large storage part. First off we had been watching this refrigerator for nearly a year at various stores and saw very little price fluctuation between the stores as well over the course of nearly a year. Appliances Connection beat everyone! 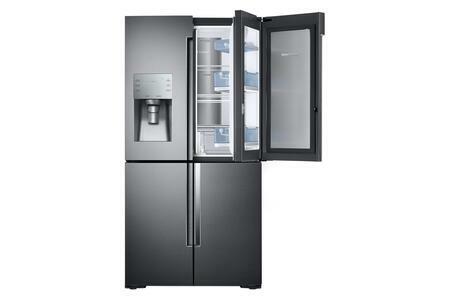 We saved $500 plus on this unit, delivery, install and 5 year extended warranty! 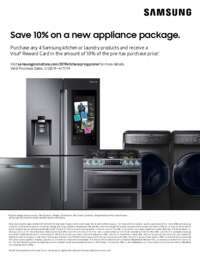 This is a great Samsung unit that was a perfect fit for our kitchen remodel. 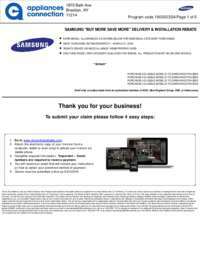 With regard to how well the purchase went and customer service. There is no need to shop anyone else. These guys at AC are great! Thank you!!! !